Partnerships for Forests is supporting PT Bumiampo Investama Sejahtera to build the first ever integrated industrial system for kemiri sunan biodiesel in Indonesia. Indonesia has 24.3 million hectares of degraded land: an area virtually equivalent to the size of the UK. Within this landscape, demand for energy from renewable sources is growing and becoming increasingly difficult to meet. In response the Indonesian government is working to transform degraded areas into productive land, to benefit local communities, businesses and the environment. It has set ambitious energy targets – aiming to have 23 percent of all energy supplied by renewables in 2025, and 25 percent in 2030. Seeking a solution to both challenges, several of Indonesia’s Ministries initiated a decade-long process to explore native species that could produce valuable commodities and restore land at the same time; the kemiri sunan tree (Reutealis Trisperma) emerged as a promising contender owing to its unique ability to grow in highly degraded areas and challenging weather conditions. The oil extracted from the kernel of the kemiri sunan can be processed into a high quality biofuel that is far more efficient in engines than fossil fuel diesel as well as other biodiesels, including Jatropha. It also claims the highest oil production yield per hectare compared to other vegetable oils: more than double that of palm oil produced for biodiesel purposes. With these credentials, kemiri sunan has the potential to transform Indonesia’s biofuels programme that is currently dominated by palm oil-based alternatives. 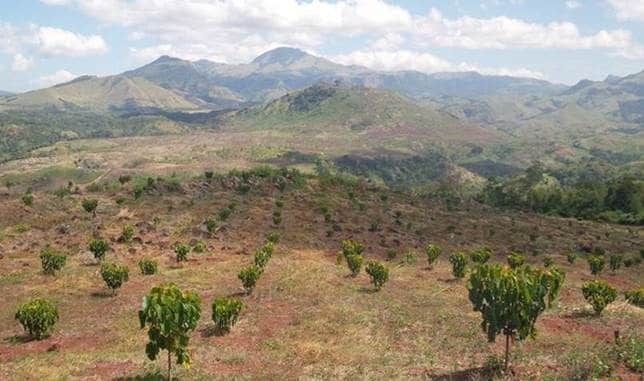 Having successfully planted kemiri sunan in several degraded areas, the company PT Bumiampo Investama Sejahtera (BIS) created the world’s first kemiri sunan plantation in Flores, which has 1 million hectares of highly unproductive land. 80 percent owned by local communities, the unique social development business model is fast showing results. BIS recently completed the second harvest from a 638 hectare kemiri sunan plantation, which indicates unparalleled yield potential – growing from 29 to 270 tonnes from the first year and anticipated to be five times higher next year. They now want to set up the first ever commercial oil extraction factory to produce biodiesel at commercial pilot scale and speed up the largely manual conversion process currently used. There is considerable interest from investors, yet they require this industrial conversion to be proven at commercial scale. Partnerships for Forests is supporting BIS to set up the commercial kemiri sunan oil extraction factory and to optimise the harvest process, which if successful, can raise further capital for a commercial scale-up. BIS will also be supported to tap into the domestic market, with the Indonesian state-owned power company as the main buyer. The project will contribute not only to the Indonesian government’s targets for restoring degraded lands for economic use, but also to its rural electrification efforts. As a result of the commercial scale-up project, it is expected that approximately 30,000 ha of non-productive land will be brought under sustainable land use management that will attract and mobilise £96 million of private investment by 2020.